Hi and welcome to backstage at Powtech! Yesterday we arrived at the Exhibition Centre in Nuremberg to set up our Malvern stand amongst the hive of activity customary before the opening of such a prestigious show. I am so excited to have the opportunity to deliver my first product launch here at Powtech. Since I became Product Manager at the beginning of the year, it has been a really fast paced and exciting 9 months working with the fresh faced Analytical Imaging New Product Introduction team to develop an exciting new accessory for the Mastersizer. Then over the last few weeks working with manufacturing engineering, production, communications, aftersales and various other teams within the Malvern business that all collaborate together to bring a new product to market. It has been fantastic to meet so many different people within the business, many of whom I had not really come across whilst in my product technical specialist role. Not only that, but actually it is even more exciting since the concept for this accessory came from our innovative Bioscience Development Initiative group over in Columbia, Maryland USA so the final product really reflects cooperation between Malvern’s global teams. Therefore, I am delighted to be able to give you a quick sneak preview of not one but two Mastersizer accessories Malvern are launching here today. 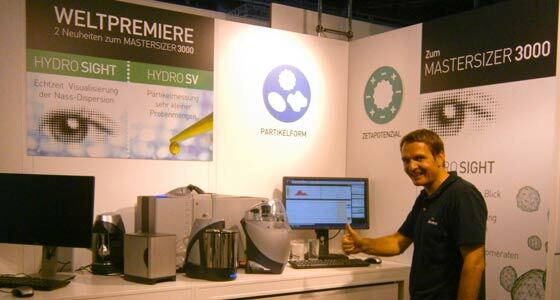 Paul Kippax and our Micrometrics team have been busy working on the Mastersizer Hydro SV, a small volume accessory for wet samples that allows users of the Mastersizer 3000 to work with just 6 or 7 ml of dispersant, ideal at early stage development when you need to understand particle size but don’t have much sample to measure or if you need to measure in solvents where the volumes need to be kept to a minimal. Secondly, my pride and joy, the Hydro Sight which brings the power of imaging to the Mastersizer. The Hydro Sight fits inline between one of our recirculating liquid dispersion units and the Mastersizer measuring cell allowing users to visualise what is happening in their dispersion. We will bring you more details on these innovative new accessories over the next few days. As promised, the photo above gives you a sneak preview of our Malvern stand at Powtech proudly displaying our Mastersizer and one of the new accessories – can you see it? If you are visiting the exhibition why not come and see for yourselves in Hall 1, at stand 357. We will be delighted to introduce you to these accessories – you’ll have the honor of being amongst the first to see them at their global debut. If you are not able to take this opportunity here in Nuremberg then you can find out more information from our website – find out about Hydro Sight here, and Hydro SV here. You can also join our online lab party celebrating the Mastersizer 3000’s third birthday, where we will demonstrate the new accessories – sign up here.